This book fills the need for a comprehensive treatment of rice entomology under one cover. 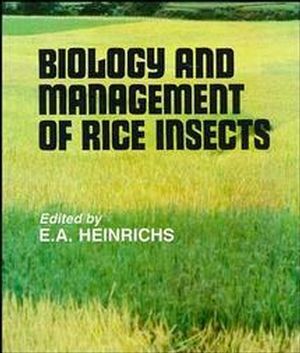 The contributors to this book, drawn from various related disciplines, discuss the fundamentals of rice entomology, the biology and ecology of rice insects and the various techniques of rice insect control , namely, host plant resistance, cultural, mechanical and physical controls, predators and parasitoids, pathogens and insecticides. E. A. Heinrichs is an entomologist with expertise in IPM. His research focus has been on the integration of resistant crop varieties with other control tactics in pest management systems. His crop emphasis has been tropical rice. He has worked in many countries and has long-term experience in agricultural development programs in Asia, South America and Africa. E. A. Heinrichs is Interim Program Director of the IPM CRSP. He has expertise in the development of IPM training programs and Farmer Field Schools for extending agricultural technology to extension workers and farmers. His research has been published in more than 300 scientific articles, and he is the author of nine books. Taxonomy of Rice Insect Pests and Their Arthropod Parasites andPredators (A. Barrion & J. Litsinger). Insect Pests of the Rice Plant--Their Biology and Ecology (D.Dale). Rice Pests and Agricultural Environments (M. Loevinsohn). Host Plant Resistance (E. Heinrichs). Cultural, Mechanical, and Physical Control of Rice Insects (J.Litsinger). Predators and Parasitoids of Rice Insect Pests (P. Ooi & B.Shepard). Pathogens of Rice Insects (M. Rombach, et al.). Insecticide Management in Rice (S. Chelliah & M.Bharathi). Integration of Rice Insect Control Strategies and Tactics (C.Smith). The Brown Planthopper: Promises, Problems, and Prospects (M.Rombach & K. Gallagher). IMPLEMENTATION OF RICE IPM SYSTEMS. Development and Implementation of Rice IPM in Japan (K. Kiritani& K. Naba). Development of an Integrated Pest Management System for Rice inLatin America (G. Weber & O. Parada).